Published: Aug. 6, 2014 at 02:10 p.m. Updated: Aug. 29, 2014 at 01:59 p.m. In fantasy football drafts, we are all looking for potential bargains ... and none are more valuable than those hidden jewels found in the late rounds. A great place to find those potential bargains is in looking at average draft position, which is also known as "ADP." Here's a look at 20 players, all being drafted in the 10th round or later, who could turn into some of the best draft values of the 2014 campaign. If you're playing in a PPR league, you would be almost foolish not to take a chance on McCluster as a No. 5 running back in the late rounds. He's hauled in no fewer than 52 receptions in each of the last two years, and playing the "Danny Woodhead" role for new coach Ken Whisenhunt makes him a good bet to at least duplicate those totals in 2014. 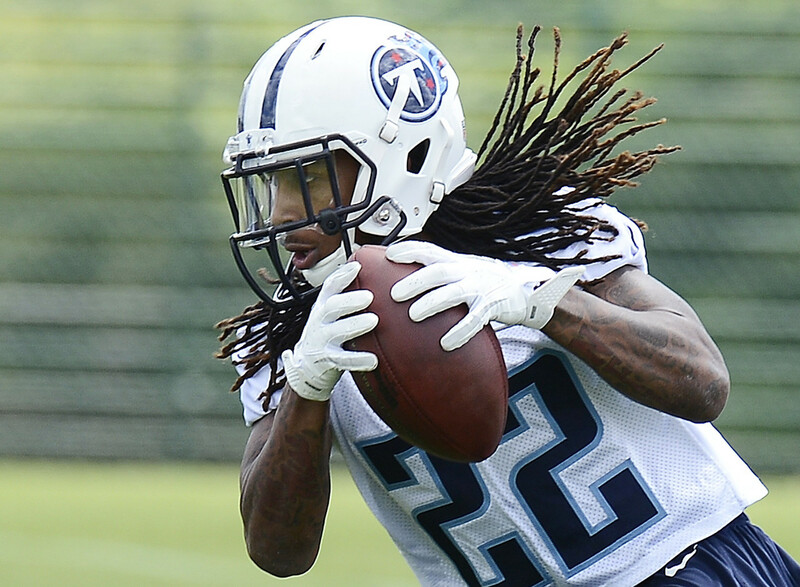 If he's effective, McCluster could end up being a serious PPR steal. Britt has shown flashes of brilliance on the gridiron in the past, but his off-field issues seemed to have derailed his NFL career. He's been given a second chance in St. Louis, where he's been reunited with his former coach, Jeff Fisher. The Rams seem to have faith in Britt too, as he's listed as the team's No. 1 wide receiver on their depth chart. He's well worth rolling the dice on in the late rounds. Hunter showed some flashes of serious potential at the end of last season, posting a pair of 100-yard performances down the stretch. While he's not listed as a starter on the Titans' current depth chart, I would not be surprised if he passed veteran Nate Washington and earned a prominent role in the offense sooner than later. Based on his 15th-round price tag, Hunter could be a strong value pick for owners. Did you know that only six wide receivers scored more touchdowns than Jones (10) last season? He'll be sidelined for the first few weeks of the season with an injury, but once he returns he could be locked into a starting role opposite A.J. Green, and quarterback Andy Dalton clearly has faith in Jones as a red-zone option. Mohammed Sanu (Round 16) is also an option while Jones recovers, but Jones has better long-term value. He could be worth a chance late as your No. 5 wideout. I am not a fan of rookie wide receivers, and the numbers are all the proof you need that most of them don't produce. However, it's hard not to get all wrapped up in the Cooks hype going down at Saints camp. He has been a "star" on the field according to reports, and it doesn't hurt to have a superstar quarterback in Drew Brees under center. If you can draft him late as a fourth or fifth wideout, make the move. Ertz had a nice finish to his rookie campaign, posting 50-plus catches with at least one touchdown in two of his last five games. A sure-handed tight end, he's also in a position to be utilized as a popular red-zone target for quarterback Nick Foles. For a player who has starting potential in 2014 fantasy lineups, Ertz is quite an attractive sleeper option for owners who don't mind waiting to draft a tight end. Ben Tate looks like the favorite to start for the Browns this season, and he's the best bet for fantasy production in the team's backfield. However, West is drawing rave reviews in camp and could etch out a nice role in the offense that's more than just a handcuff. When you also consider Tate's proneness to injuries, it wouldn't be a major surprise to see West start a few games during his rookie campaign. Brian Hoyer might be the starter for the Browns, but I'm still on board with Manziel as a potential fantasy sleeper. Sooner or later, he's going to be given a chance to take the top spot on the depth chart and run with it ... literally. The highly-touted rookie out of Texas A&M rushed for over 2,000 yards and 30 touchdowns during his two collegiate seasons. Not bad for a quarterback, right? Second-year wide receivers are breaking out more often in the stat sheets. In fact, five posted 1,000-plus yards last season. Enter Hopkins, who had a mediocre rookie campaign but has the talent to make a much bigger impact as an NFL sophomore. When you consider that he's coming off he board at the 13th round on average on NFL.com, you can see the reason I like him as a potential bargain for owners. Woodhead might not be the "sexiest" name in fantasy football among running backs, but he sure does produce on the gridiron. Last season, he ranked 19th in fantasy points at his position in standard leagues and 12th in PPR formats. In fact, Woodhead scored just nine fewer fantasy points than Adrian Peterson in those leagues. That's impressive for a player you can land as a No. 4 running back in some drafts. Rivers was one of the best draft bargains in fantasy land last season, finishing sixth in points among quarterbacks. Maybe it's the depth at his position or the loss of former offensive coordinator Ken Whisenhunt, but Rivers is still not getting much respect in drafts. In fact, he's being picked as a No. 2 fantasy quarterback in most leagues on NFL.com. You should be using that to your advantage in building your own draft strategy. Rudolph had a forgettable 2013 campaign, but he's in a great position to succeed this season. The Notre Dame product will be a popular target in the Vikings pass attack under new OC Norv Turner, who has had more than his share of success with tight ends in the past .. Jordan Cameron, anyone? So if you're the sort of fantasy owner who likes to wait to draft a tight end, Rudolph is a good player to target late. Miller was a popular sleeper last season, but he left egg on the faces of a lot of analysts (including myself). However, the health of Knowshon Moreno's knee coupled with Miller's solid camp (to this point) makes the latter a potential sleeper once again. Fantasy owners who focus on running backs earlier in their draft could end up nabbing Miller as a No. 4 fantasy runner. That could be a tremendous bargain. Owners in PPR leagues shouldn't forget about Sproles, who ranked 24th in fantasy points among runners in such formats last season. Now in Philadelphia, he's seeing time at wide receiver during camp and will remain a potential PPR standout under new coach Chip Kelly. For a player who could bring back No. 2 fantasy running back value in these formats, Sproles is far more valuable than an 11th-round selection. Colston is coming off a season in which he failed to post 1,000 yards for the first time since 2009, but owners forget that a foot ailment limited him in the first half. Once he was closer to 100 percent, the veteran out of Hofstra recorded 601 yards and four touchdowns over the final eight games. At 31 and not exactly "over the hill," Colston remains a threat to produce No. 2 or 3 wideout numbers for owners. I'm going to guess that the reason Maclin is sliding in drafts is the fact that he's coming off an ACL reconstruction, because he's in a great position to find statistical success. In fact, the top wideout in Philadelphia last season, DeSean Jackson, recorded top-10 fantasy totals at his position. Should Maclin reach his potential in this offense, you could be charged with theft based on his current price tag. Darren Sproles is out of the mix, meaning Thomas will continue to be utilized as a major pass-catching option out of the backfield for Drew Brees. That's exciting for owners in PPR leagues, as Thomas hauled in an impressive 77 passes in the offense a season ago. A top-25 running back in both standard and PPR formats in 2013, it's hard to imagine landing him as a No. 4 fantasy back ... but it's clearly possible. Let's see ... Romo is in an offense that will throw the ball a ton under new offensive coordinatorScott Linehan. He's also on a team with a defense that's projected to be awful, meaning Romo could be asked to throw quite a bit in the second half of games in an attempt to erase deficits. While his return from back surgery is a cause for concern, you still can't overlook the potential value with Romo as a 10th-round draft selection. Sanders is no guarantee to end up producing the same sort of numbers as the departed Eric Decker, but can he produce solid numbers? I think so, don't you? I mean, his quarterback is Peyton Manning! If he can reach his potential in the stat sheets, Sanders will be in the discussion as a No. 2 fantasy wideout. That wouldn't be so bad when you consider you're likely to get him as a No. 3 or 4 option based on ADP. Wright posted career bests in receptions (94) and yards (1,079) last season, and his touchdown total (two) is guaranteed to increase under new coach Ken Whisenhunt. That's the same Whisenhunt who's offense made Keenan Allen a fantasy star during his rookie campaign. If you can land Wright as a third wide receiver in standard or PPR leagues, which is possible in Round 10, you'll be in a good spot at the position.